I made a 1-1/2 batch so I would yield 36 cupcakes as opposed to the usual 24. The result… well, the cupcakes tasted fine, had a nice texture, but were rather plain (were it not for the frosting). The cocoa taste was not discernable and I recommend increasing the quantity in the recipe. If I were to test the recipe again, I would increase the cocoa by 50% and 100% and check the results. I doubt I will test it again, however, as the novelty of red batter isn’t interesting enough to distract me from other recipes I want to try. This will make a lot of pastillage, I used 1/4 of it to make more than enough shapes for 36 cupcakes. Given it lasts so long, doesn’t hurt to have extra. A note on coloring, needing in powdered food coloring gives a nice matt look or you can paint it on for some variation in color. Occasionally the chemical engineer in me rears its nerdy head, like it did this weekend. I got to thinking about the baking soda versus powder versus both and was led down a trail past anthocyanins and essentially to the question of how does pH effect the end product. Chemical leaveners when used correctly react with other compounds to release carbon dioxide gas which will cause the cake to rise. They are often “double acting” – would say so on the packaging – meaning they react when added to the batter and release some gas bubbles, then there is a second reaction later on which cause the release gas bubbles to expand. * Baking soda is alkaline and requires acidic compounds to react with it. These can be yogurt or sour milk. * Baking powder contains baking soda and acidic salt crystals. It basically contains what it needs to cause the chemical reaction and produce carbon dioxide. In the case of this recipe, there is buttermilk and vinegar (both acidic) which will react the baking soda. Baking powder should not be necessary – in theory. There are also theories that the acidic compounds react with cocoa (or the anthocyanins in cocoa) to turn the batter reddish-brown, but I read here that it is a scientific myth. I looked into anthocyanins and indeed they do need an acidic environment to be red, but I was tending to agree with the first article that there aren’t enough of them in the chocolate for it to really matter. I looked into it some. This article says that quantities are “high” in green tea and chocolate, which this article confirms, but it also adds that processing causes the anthocyanins to convert to quinones which then further react and result in brown-colored compounds. So, I suspected that any change in pH wouldn’t really make a difference in color, plus I was planning on adding food coloring. So, I started with a base batter with just baking soda and then divided it into three and added baking powder to one and cream of tarter to the other (note: cream of tarter (acid) + baking soda can be used a substitute for baking powder). The baking soda-only batch definitely looked the worst, but there wasn’t a noticeable taste or color difference amongst the three. The other two versions were pretty darn close, hence why I suggested baking powder or cream of tarter. In theory, you could use baking powder only, but I didn’t test that option. yum! we like ours with a lot of chocolate. they are not always the most red, but they are tasty! Thank you for the nerdy diversion – I think more bakers should think about and know these kinds of things! Your photography is also very lovely. How have I not found your website until now?!? Love your site! Most recently, I loved the ice cream cone cupcakes. Very cute. I have a question, can you recommend a good frosting for cupcakes that you take to a picnic where they may sit out for a while unrefridgerated? I dont want a runny frosting. Thanks! 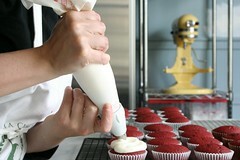 I find that stiff buttercream with its high sugar content, can sit out for some time without getting runny or spoiling. Even better is to make them the day before, refrigerate, then bring them to the picnic… They should be well set at that point. Chockylit, I just posted about this super write up of yours! I love this type of post and thank you heartily for your info! Love that you go through the trouble of not only explaining (like I usually do) but also shwoing the effects of what you’re explaining. Excellent! i am cooking cupcakes for a tower for my brothers wedding, all the recipes i have tested either sink in the middle, or are nearly flat…i am looking for some choc recipes that have a lovely dome effect. i am hoping to have thin layer of fondant then heart shapes on topo, but after seeing your frosting, i might try that first. do u have any suggestions? they prefer a moist chewy/dense sort of cake, not a fluffy one? I really like the way you piped the frosting on these. They look fab. What sort of tip did you use? Lindsey, I used the big plain tip in this picture, http://www.flickr.com/photos/chockylit/48794096/in/set-180812/. Kasier 13-mm I think. I love your blog. Not only the recipes but the way you go about them. I love cupcakes but my frosting/icing technique is poor. Thank you for taking the time to explain leaveners. I worked at a place last year where we made our own baking powder (cream of tartar+ baking soda.) The results were markedly different. The original red velvet cake was the original devil’s food cake but with very poor cocoa, hence the chemical reaction you describe. I agree that the novelty is not worth it for me. the reason I have seen for the use of BS and BP to be used together is when BS will not give enough rise. It’s not as strong as BP. Great blog, I will start visiting more often! I love your site and appericiate you sharing your recipes in such an understandable way but I must ask something completely unrelated-how do you make those tiny flowers thingies beside the things you write? :) Please share! Yum, what a truly inspiring baking blog. I will start visiting more often. Thanks for the nerdy excerpt! Always great to learn more about ingredients and their purposes etc. I’ve never had a red velvet cupcake so I will probably try soon just to see how it tastes. Couldn’t help but notice your pretty yellow KitchenAid and your CCA-logo (apron/shirt)? Did you take the B&P program there? Hope I’m not being too intrusive. I apologize, I just saw your website and read that you are taking classes at CCA, sorry my mistake I should’ve checked first! Mandy, Moist and dense plus a dome… Its interesting, with cakes you don’t want a dome. Well, when you have one, you chop it off so your cake is flat. Cupcakes, however, look cute with a dome, don’t they. Hmmm, there is a lot to getting a dome and some recipes lend themselves more to it than others. I don’t really know the answer. Fill the cupcakes up high with batter will help, but you run the risk of overflow. So, its a balance. When I come across the perfect moist/domed/chocolate recipe. I will let you know! Mel, no worries! I haven’t taken the full on B&P program CCA, just weekend courses. I took a week long B&P bootcamp at CIA in St. Helena. That was fantastic. If I were to do a full program, I would definitely go there. The facilites were inpiring. Oh, Yael. It was by accident, the flower thingies. When I was preparing the post, I decided to use ordered (ul) and bumbered (ol) lists to clean it up a bit. In blogger they looked like the usual dots and numbers, but when I published the post, I got the flower things. Seems like it has to do with the style sheet of the template I use. I haven’t had time to look at it yet. Where can you get Vanilla Bean? Hey, juno_star101, I normally get vanilla bean at Whole Foods. A great online alternative for vanilla bean and other exotic spices is Penzey’s, http://www.penzeys.com/. 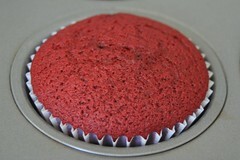 I followed your recipe for these red velvet cupcakes as it was very close to other red velvet recipes. What type of food coloring do you use? Powder, gel, grocery store liquid? I had some concentrated gel coloring and combined it liquid to make the amount needed. Don’t know if this was the best thing. I used what I refered to as paste, but it is the concentrated gel… like the kind from Americolor. I didn’t dilute it. If they come out red enough for you, then I think that they are fine… That’s really all the food coloring is for. I would love to make these for an upcoming Valentine’s Day tea that I am having. Could I make them mini? And if so, how would I go about doing that? Thanks! I absolutely ADORE your site!!! Beth, Minis are not a problem. Instructions are the same, but baking time is more like 12-15 minutes as opposed to 22-25 minutes for regular. chockylit, thank you for the wonderful recipes and pictures! This is a bit of a late comment, but I wanted to say that I made red velvet cupcakes a couple weeks ago and used your cream cheese frosting recipe. They froze most excellently and my sister and a visiting friend polished them off, straight from the freezer, this weekend. I LOVE red velvet cake. i am baking for a birthday party this weekend and would love to know if u think this is worth me trying. I am just starting to bake. Have been using box mixes forever and want to start experimenting. What kind of butter do u recommend for baking? what is the weight of one package of gelatin, i love these cupcakes, so good! one quarter of an ounce per packet. you are my hero, seriously. i am a cupcake novice, and everytime i have a question (if it doesn’t get answered effectively on flickr.com) i always come to your blog for answers. anytime i need a recipe, i always check here first. 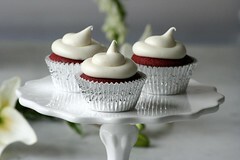 i will be baking these red velvets with my 14 yr old cousin next weekend. wish us luck!! Do you use dutch processed cocoa powder? One last thing, do you think Wilton’s No-Taste Red Icing Color will work? PS: I sent you a message concerning this recipe on flickrmail. I don’t use dutch processed generally. I think Wilton’s icing color would work fine. Not sure how much to use compared to gel, but you should be able to eye ball it. Those are beautiful and I’m looking for a good-tasting red velvet cake recipe! In the quantity of batter your recipe yields, how many cake pans do you think that would fill? A friend of mine requested red velvet cupcakes for her birthday this year, and I made these. Your recipe was really solid and I appreciate all the notes you made about your experimentation. I also agree the red batter novelty isn’t really worth it, but my friend was thrilled. I’ve been challenging myself to make 50 new recipes a year and this was one of them. I loved making this, and thanks for posting the recipe. First, I absolutely love your website–I just finished making the red velvet cupcakes and I was just double-checking the icing recipe before I make it. I always make cupcakes in batches of 24 or less–I was curious how you manage to cook 36 cupcakes at once. First, I was going to wait to cook the last 12 but then I figured I would be able to space it evenly in the oven and then move the trays around half way through baking–Now I wish I didn’t do that b/c a few ended up looking like your “baking soda only” cupcakes but I think that’s b/c I interrupted the baking process by opening the oven and moving them around. I’ve read that you should always rotate the pans halfway through baking–I don’t know if I’d recommend this. I also doubled the cocoa content to 1/2 cup–I agree that the cupcakes still don’t have a great flavor, I’m just making these for a friend’s birthday. 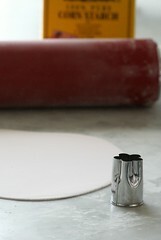 I’m excited to make the frosting next…Thanks so much for publishing your efforts, I will be visiting your site often!! Although I commented on your cupcakes previously, I was hoping someone would make them for my 49th birthday last week. I received hundreds of texts and e-mails and 37 phone calls – but I kept waiting for my mother’s annual call. She never called. But I did get a wonderful birthday gift from my new boyfriend “Big Bear”. My hirsute companion gave me a wonderful used cutting board. I could tell it was used because it had grease stains on it (but I’m sure he meant well). But hey, when you’re a fat, 49-year old Italian immigrant (who has been divorced four times), you have to hold on to whatever you can find. But, still . . . no cupcakes (or ANY cake for that matter). And this recipe looks wonderful! I was very impressed to read about your red velvet cupcakes. The detail in how your recipe came about, as well as the explanation of the baking powder and baking soda was great! I made your recipe last night, increasing the cocoa as you recommended. The flavor and texture were good, and the cream cheese frosting was tasty too! I’m looking forward to trying more of the cupcakes you have written about. Thanks for all the inspiration, and keep up the delicious recipes! i am a red velvet cake lover, mostly due to childhood memories and the cream cheese icing i’m sure, but i found this recipe to be not very accurate. i felt the cake was to light and too dry, normally it is a much denser cake, these were almost healthy tasting. from the sound of things these really aren’t your thing, which believe me i get- i just know they’re probably a popular search on your site so i’m thought you might like to hear how it turned out for me. the icing however was A-MAZING. the best i’ve ever made. your site is fantastic, thanks for all the hard work. I love red velvet cupcakes. I’ll definitely try your recipe and see how it goes! 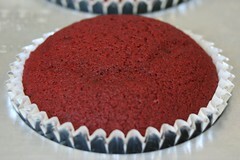 I am searching the red velvet cup cake recipe for my birthday in the next couple of days. RV cup cake is not too familiar in my country yet therefor I want to start it. Thanks for sharing the recipe and tips, I am gonna use it. my girlfriend absolutely loves cupcakes. her sister made a red velvet cake a while ago and it was delicious. i’m sure she will fall in love with this recipe when i give it to her. Hi Its’ my fiance’s birthday today, and I made him your red velvet cupcakes last night. I 100% agree, i definitely doubled the cocoa and it made a world of difference (normally I dont think red velvet is so wonderful except for the frosting!!) but these were DELISH!. One question though, i made it with BS + Cream of Tartar. In reading your post initially you said in theory Baking powder would not be necessary and in the end you say ” In theory, you could use baking powder only, but I didn’t test that option.” –> Don’t you mean you could use Baking soday only?? I love your cupcakes, they look so cute. I have yet to try to make them. Keep up the good work! 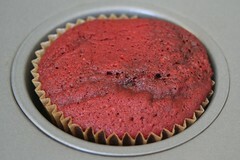 I am again venturing into cupcakeland doing my research on red velvets. I have seen a couple recipes where the vinegar is added directly to the baking soda, allowing it to foam up, and then added as the very final ingredient/step. I wonder why that step would be advantageous as opposed to adding the dry in with the dry, the wet with the wet, etc. I tried a couple batches and got some darker, almost uncooked, patches on the tops of my cupcakes. The patches get a bit crunchy when they cool down. Not the most attractive looking blemishes, but, like make-up, my frosting can just cover them up. hi dear im thinking of making red velvet for my colleagues on my last day as a parting gift but im not sure how long the cream cheese frosting can last without the fridge! I would say about 2 hours, but I have left cream cheese frosting out at work longer. Its usually fine if its not hot or anything. I made the recipe today, in a 1/3 batch, with twice the amount of cocoa. I agree with another poster that it’s very light compared to your typical red velvet, though absolutely delicious- it has a delicate chocolate flavor, which is leaps and bounds better than the tasteless red velvet you find at most bakeries. I am, however, a little worried about frosting: I was planning on filling my cupcakes, and I’m anticipating problematic moistness and seepage issues. We’ll see how that goes. These look delicious! Just two question: for the 1/2 ounce red food coloring paste, can I substitute it for red food coloring gel, and will the amount stay the same? And I converted the 1/2 ounce to teaspoon and got 1/2 ounce = 3 tsp., does that sound about right to you? Thanks very much! And amazing job on these cupcakes! I made these for the second time tonight. I must say this is a great recipe. I don’t like chocolate cake but the slight chocolate taste is perfect! I <3 you! Thankyou so much for this, I’ve been baking for a little while, and it’s wonderful to finally look at the differences from different ingredients so I can really think about what I’m putting in the cakes. Thanks again, this blog is amazing! !